The role of NDRRMC and its provincial counterparts - PDRRMC when it comes to disaster prevention is noteworthy most especially for weather related issues. But risk reduction is not always dependent on the government. We also share the burden of being watchdogs of our own safety when typhoons and floods ravage our homes. It’s appalling to see the news filled with human casualties due to these recent monsoon rains. But it’s even more disheartening knowing that it could have been prevented when everyone exercise more caution during a weather like this. In relation to that, here are some guidelines which may help make it safer for everyone at this time of the year. 1. Authorities, organizations, and everyone else will agree that it’s best to stay home when there’s not really anything important to do. Most of the casualties I’ve seen over the news these past few days are related to this. 2. Never underestimate what Mother Nature can do. Translated, stay away from bodies of water most especially where there is flowing current. Even the best swimmers can be easily washed away and tossed by a heavy water tide. In connection to this, fishermen should be aware of gale warnings to know when it’s no longer safe to fish out in the open sea. 3. Evacuate when necessary. Devise a plan which will make it easier to move everyone at home from your house to a specific location such as a relocation center or somewhere safe. Be aware of varying levels when it comes to rainfall volume so you know when it’s time to leave your house and temporarily stay to a safer location. See image below from PAGASA. 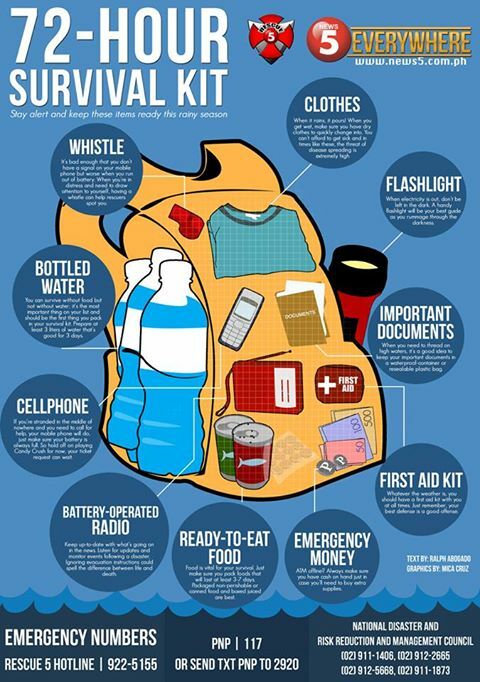 Still in relation to evacuation, prepare a 72-hour survival kit for each member of the house. See image from Red Cross below. 4. Avoid prolonged exposure to flood waters as it increases the possibility of acquiring deadly leptospirosis. 5. Have a handy list of phone numbers to call in case of emergencies including medical in nature. See previous post for emergency hotline numbers. 6. Be wary of loose electrical wires from damaged power posts. Likewise, turn off breakers at home before flood even reaches plugs. 7. Have a stock of ready-to-eat food or those which do not require tedious cooking such as rice, eggs, noodles, and canned goods. You should also fill containers with clean drinking water. These are only seven tips. When you prioritize you and your family’s safety, I’m sure that you can come up with your own disaster prevention and preparation tips.